The 9th Fighter Squadron stationed at Balad Airport, Salahuddin Province, Iraq operates the Lockheed F-16IQ Block 52 aircraft with the first 4 aircraft arriving at Balad on 13 Jul 2015. 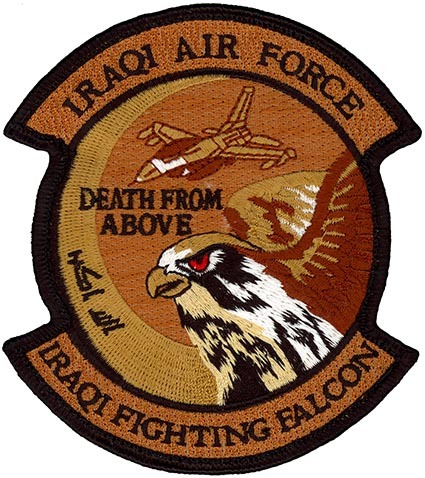 The Iraqi Air Force (IQAF) (Arabic: القوة الجوية العراقية; Al Quwwa al Jawwiya al Iraqiya) is the aerial warfare service branch of the Iraqi Armed Forces, responsible for the policing of international borders and surveillance of national assets. The IQAF also acts as a support force for the Iraqi Navy and the Iraqi Army and it allows Iraq to rapidly deploy its developing Army. The Iraqi Air Force was founded in 1931, during British rule of Iraq, with only a few pilots. Aside from a brief period during the Second World War, the Iraqi Air Force operated mostly British aircraft until the 14 July Revolution in 1958, when the new Iraqi government began increased diplomatic relationships with the Soviet Union. The air force used both Soviet and British aircraft throughout the 1950s and 1960s. When Saddam Hussein came to power in 1979, the air force grew very quickly when Iraq ordered more Soviet and French aircraft. Its peak came after the long and bloody Iran-Iraq War, which ended in 1988, when it consisted of over 950 aircraft, becoming the largest air force in the region. Its downfall came during the Gulf War (1990–91) and continued while coalition forces enforced no-fly zones. The remains of Iraq’s air force was destroyed during the 2003 invasion of Iraq. Currently, the IQAF is rebuilding and receiving most of its training and aircraft from the USA.